Manchester City Council’s offices were housed temporarily in First Street and food and drink fuel on site for their team was urgently needed. It had to be high quality, stylish and flexible, so the search was on for an ideal solution. The stakes were high when accepting the First Street challenge: it was a little out of Broderick’s comfort zone, being only the second cafe bar - after Manchester Airport - that the vending specialist had delivered. And with First Street being the new neighbourhood everyone’s talking about in Manchester, there was no room for anything but quality. Initially briefed to provide a food and drink solution for Manchester City Council’s temporary offices, the cafe bar has become a Manchester foodie destination since the council moved out and latterly a string of high profile businesses have moved in. 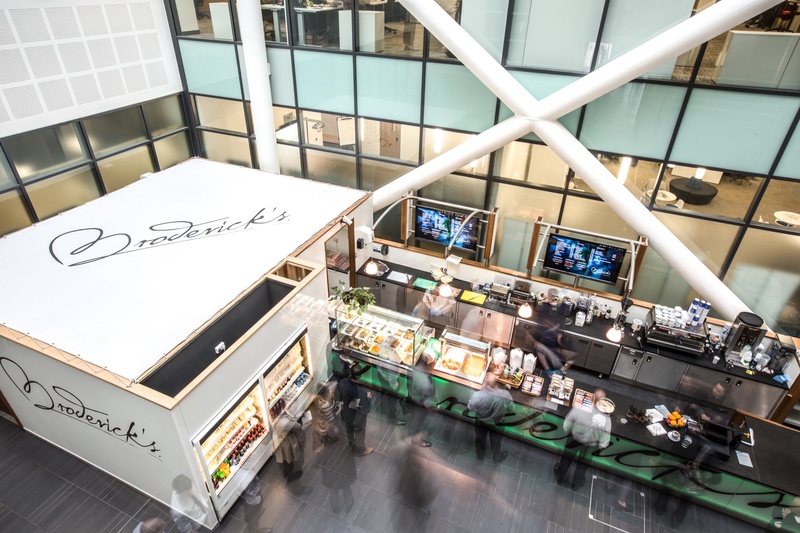 The Broderick’s First Street Atrium coffee bar now serves up to 2800 people located in the building, from major businesses like Amaze, Ford , Auto Trader, Gazprom and Jacobs Engineering. Broderick’s has also installed the latest in vending machine technology on several floors to support further refreshment requirements. A fast growing business and leisure hub, number one First Street houses a community of several different businesses, which means that all types of tastes need to be catered for. Thanks to in depth experience of developing menus for the thousands of people heading through Manchester Airport each day, Broderick’s was able to take on the taste challenge with valuable expertise. Guarding against menu fatigue, the cafe serves up delicious dishes, ranging from a full English breakfast to heartily filled sandwiches. Of course, Broderick’s trademark bean to cup aromatic coffee is always on the menu – alongside all the other boutique cafe favourites.